If I wasn't a fan of shopping on the Web before, I became a fan several years ago, while standing in line at a large retail store in the wee hours of a frigid Black Friday in the Mountain West. My wife and I had arrived shortly after midnight, timed to avoid the crush at the door and confident that the items we had on our list would still be available. In an effort to justify staying up all night, braving ice, snow, and aggressive drivers enroute from our car to the doors, we settled on a cheap pair of kids PJs, a pair of ugly socks, and a doll in a damaged box. Our plunder in hand, we walked to the back of the store, joining one of the infinite lines and proceeded to wait for our turn to pay for things we didn't really want. Thinking back to that experience, the online experience was obviously better than the in-store experience, but it wasn't great. The site wasn't optimized for a mobile shopping experience, and more than a few times, I had to back out and start over because the site errored out. Today's consumers find a greatly improved experience when they're shopping online, and they have come to expect an experience which is clean, easy to navigate and optimized for their device. If expectations aren't met, finding a site which does meet those expectations takes a couple of clicks on the mouse, or taps on a screen. This is true at any time, but perhaps more so during the Holidays when consumers are short on patience and expect things to work as they should. As developers, designers and quality assurance folk, we're obligated as professionals to provide our consumers with the best possible experience while interacting with our organization's online presence. Failing to do this, especially during times of high traffic like the holiday season, will inevitably result in a loss of engagement from visitors, and ultimately impact our company's bottom line. Which Browser or Hardware Configuration Should You Test? We've all heard the phrase "It works on my machine." And it's possible some of us have even uttered it. We all have our favorite browser and mobile platform, and we do a pretty good job at testing with them, but the others seem to fall through the cracks. 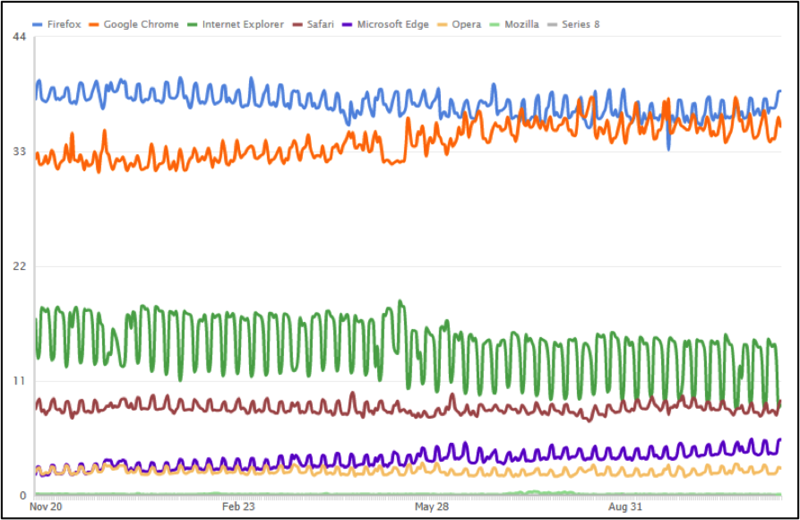 We can always focus testing efforts on the dominant browser in our market segment, but even in regions where one browser appears to be dominant, it usually has less than 50% adoption by users. Usage statistics are constantly changing, and vary from one region to another. 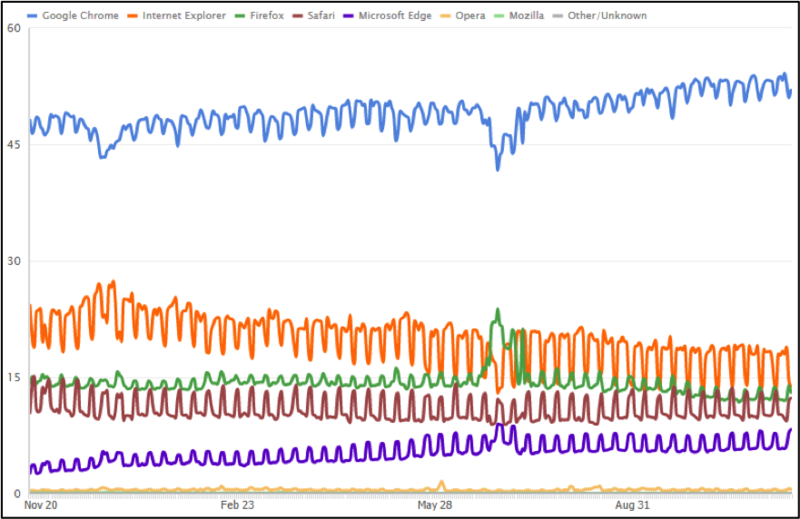 The graphs below show browser market share from clickly.com over the past year in the United States and Germany. It should be noted that these are one part of usage, with mobile browsing having distinctly different and ever-growing trends of its own. But How Can I Test Them All? The prospect of having to test so many combinations of browsers, platforms and operating systems can be daunting, but it doesn't have to be. Using an automated testing solution such as the one offered by Sauce Labs, a user can automate browser testing on any combination of browsers and operating systems, including mobile devices. The long-term benefit is that once you have it set up, you can run your entire suite of tests on any combination of browsers, operating systems and devices in very short order. By automating testing of your site, you not only gain access to testing across multiple browsers and operating systems, you can also test all of these combinations simultaneously - both speeding up validation that new changes haven't broken the user experience and improving confidence that they will work for as many user configurations as possible. If you're unsure of how to get started, I would recommend the following cross-browser testing tutorial on the Mozilla Development Network (MDN) as an excellent starting point to begin your automated testing journey. While the focus of this article is testing and ensuring the readiness of your online presence for the holiday season, in truth, it is something that we should all be concerned with on a daily basis. The stakes may be greater during high traffic times, but the fact is that it's part of being a professional to ensure that our products are available and functional for all of our consumers, no matter what browser they choose, or what device they use for access. Ensuring our work is of a high quality is also part of being a good steward of the piece of the Internet we own, and at the end of the day, setting up automated testing with today's tools and services is a lot easier than you might think. Mike Mackrory is a Global citizen who has settled down in the Pacific Northwest - for now. By day he works as a Senior Engineer on a Quality Engineering team and by night he writes, consults on several web based projects and runs a marginally successful eBay sticker business. When he's not tapping on the keys, he can be found hiking, fishing and exploring both the urban and the rural landscape with his kids. Always happy to help out another developer, he has a definite preference for helping those who bring gifts of gourmet donuts, craft beer and/or Single-malt Scotch.